Parker's Barkers: An Unexpected Adventure! Yesterday we decided to go to the Mullet Festival in Everglades City. We headed south to Route 75 at o'dark thirty. 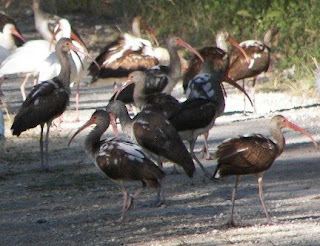 At the entrance to the interstate we saw half a dozen Wood Storks waiting for the sun to come up. I knew it was going to be a great day! 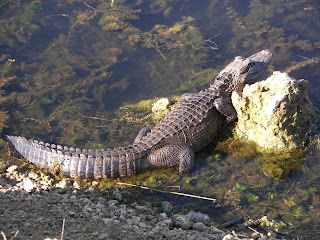 Before we reached Everglades City we saw a sign for Jane's Scenic Drive in Copeland and made an unexpected right turn. 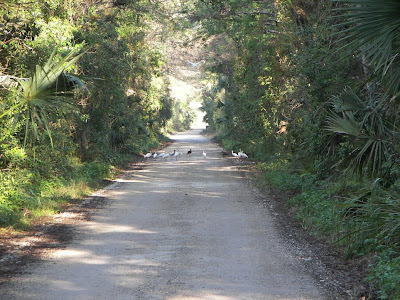 The 11 mile drive is part of the Fakahatchee Strand Preserve State Park. It's like a drive-through Corkscrew - Amazon style. We watched this female Osprey for a while while she called to another Osprey. He returned her call. They called back and forth for a few minutes. 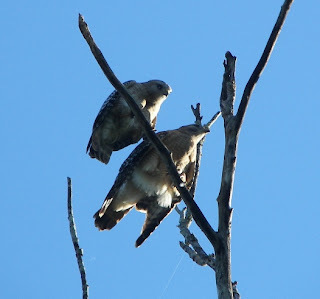 Soon the male Osprey came flying in to mate with her. Notice how her position changed to get ready for him. Once he was finished, he rested for just a few moments before taking off. The encounter was amazing to watch! 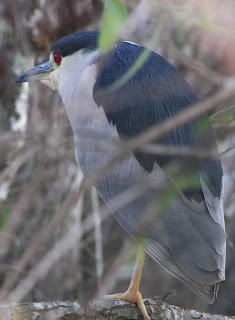 This Black-crowned Night Heron was quietly sitting in a tree on the side of the road. 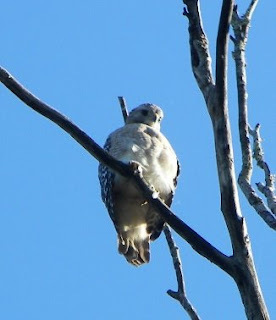 This is a large, stocky bird - standing about two feet tall. Another shot of this beautiful bird. I took dozens of pictures but it was hard to get the proper focus with the branches in the way and I was afraid to get any closer for fear I would spook him. 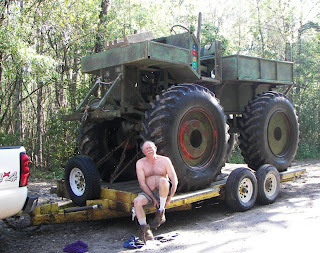 A little further down the road we met this swamp native and his swamp buggy. 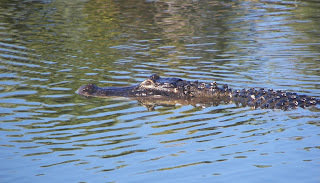 He was on his way to the swamp buggy races. He told us he had a cabin about a mile into the swamp. That must be interesting in the middle of the summer! 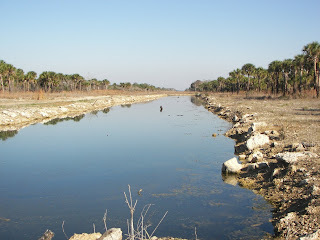 At the end of the 11-mile road, we came to this canal that once was a major access-way into the Everglades. 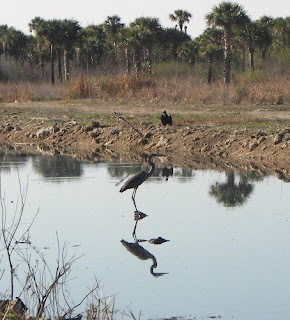 Long abandoned by people, it was now home to scores of birds and alligators. This guy was just hanging out - and yes, I really was that close! 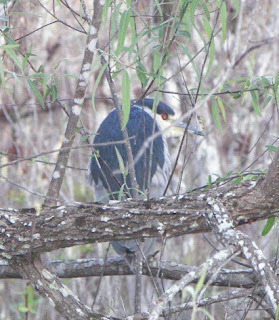 Bill was on the other, more traveled, side of the canal - but I wanted the pictures! 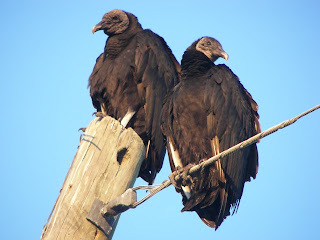 Look at this gorgeous pair of Black Vultures! OK - maybe gorgeous isn't exactly the right word. 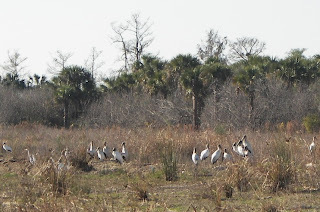 On the far side of the canal was a flock of Wood Stork. There were dozens and dozens! We had to go back down the drive the way we came because there was no easy exit by the canal. While Bill drive slowly, I stood on the front seat and stuck my head out the moon-roof to get these pictures. This flock of Ibis was blocking the road. It was an interesting group of mature adults (all white) and immature birds in various stages of molting from brown to white. 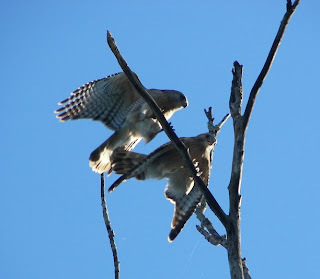 The Fakahatchee Strand Preserve was an adventure we hadn't expected to take - but it was wonderful! After we left, we headed down Route 29 to Everglades City hoping we weren't too late for the start of the Mullet Festival.